1. LOVE Wallhanging - my first finish of 2013 too! 3. Hexie Snowflakes - pile keeps growing! 5. We Bee Modern Too blocks - December and January - no progress! uh oh..
6. do.good blocks- January blocks - pulled fabric, no progress. 7. Mod Pop quilt - top has been finished for ages, I need to back and quilt this asap. I have about a million of these, but I want to destash, declutter and finish some projects before I start anymore!! adorable hexi snowflakes and congrats for having a 2013 finish. Hexie snowflakes! What a splendid idea! Looks like you've got a lot on your plate. Good luck with everything and don't stress yourself too much. Cute mini! And I'm still amazed at the tower of hexagons. Good luck on the de-clutter! So just a small WIP list then ;o) Good luck! Love those hexie snowflakes -- can't wait to see what you do with them, Jennifer! Your stack of hexi snowflakes is too awesome! LOVE your hexie snowflakes. It's taking me forever to figure out how to sew mine together. Your mod pop is looking fabulous too! Love your hexie snowflakes. Good luck finishing some projects! 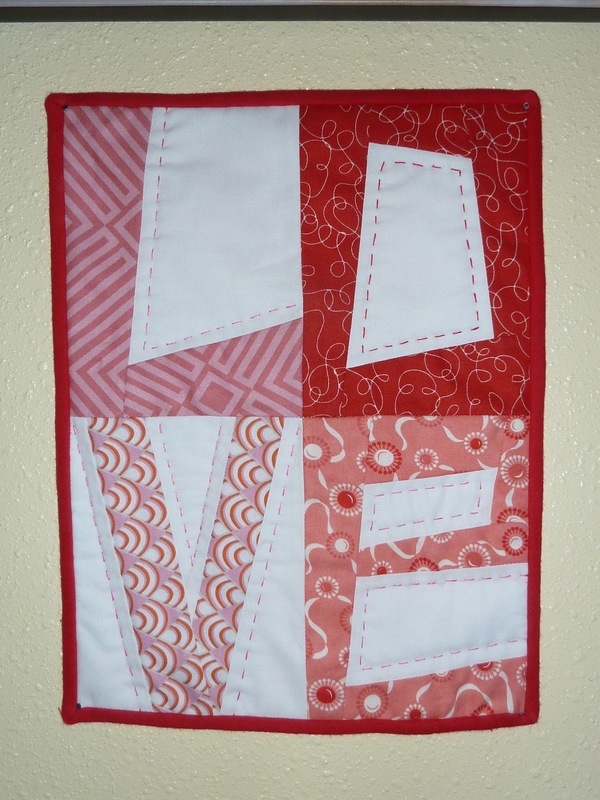 The Love wall hanging sure is cute. I was gifted 2 boxes of pre-cut hexagons in 2 different sizes---now I just need to learn how to sew them together. You are working on TWO mod pops? How did I miss that?! Those hexie snowflakes just continue to amaze me!! I would have to do the same. I can't even remember the last time I linked up! I really should get back to doing that.